The Loon’s Necklace is a short that tells the story of how the loon got its distinctive band around its neck. It is the story of Kelora, a once proud medicine man who is now neglected in his feeble old age and blindness. Having saved his tribe from many dangers, Kelora seeks out his totem, the Loon, and asks to have his sight restored. The Loon gives him back his sight and in return Kelora places his necklace of magic shells around the neck of the bird. The film helped launch Crawley Films and is certainly one of the most successful “sponsored films” ever made. The sponsor, by the way was Imperial Oil and the film was seen for years in classrooms across Canada. 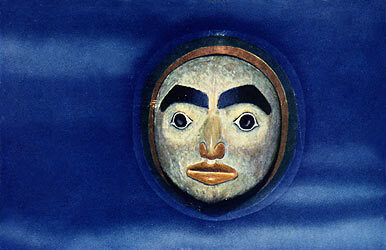 It was Judith Crawley’s idea to use West Coast First Nations ceremonial masks to illustrate the legend. The Loon’s Necklace won film of the year at the first Canadian Film Awards. It was identified as a “culturally significant film” by the AV Preservation Trust in 2001.